Well, if you haven’t heeded the advice that we have been handing out freely for the last two months, your time has run out. If you don’t have your soil and pots ready by now, procrastinate no longer. This is the month that repotting begins in earnest. Our lists and notes for our various trees should be completed. Begin to watch your trees carefully. Repot when the buds begin to swell. Newly potted trees need a certain amount of special aftercare. For the first two to three weeks, place them in a warm sheltered position. Keep them out of direct drafts and strong winds. They will benefit from having their foliage misted whenever time permits, particularly if the weather is not very humid. Foliage spraying must not constantly rewet the soil in the pot. After the initial saturation of the soil immediately after potting, the soil should not be rewatered until it is just beginning to show a little dryness. After about three weeks the tree may be moved to a more sunny location and treated normally. Do not fertilize a tree that has just been root-pruned for four to six weeks. Then use a dilute solution, half strength, for the next three weeks. 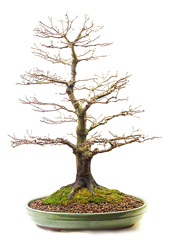 For trees that have not been repotted this year, your fertilizing program can now begin. Remember, it is better to fertilize regularly and fairly frequently with small doses than to give a strong dose every now and then. I fertilize all trees weekly. I use Dyna-Gro at the standard dosage once a week and I also place fertilizer cakes or Bio-Gold on the soil surface. Other good fertilizers are fish emulsion, seaweed extracts or slow release fertilizers such as Osmocote. If your soil is too high in PH you may want to consider adding white vinegar or PH Down to your water. Especially for acid loving plants. Remove any wires that were left on from last year that may be getting tight or cutting into the wood. The tree will experience a large flush of spring growth and the wires could cut into the wood if left on. As shoots start to grow, start pinching back. This pinching process will be carried out for the next several months, until the growth is curtailed by hot weather. Trim off water sprouts as they appear. As you take your trees out of winter storage, be careful not to subject them to wind, rain or frost. The transition should be gradual. Do not subject trees stored in subdued light to bright sunshine. Be ready to move them back inside if the weather turns cold again. 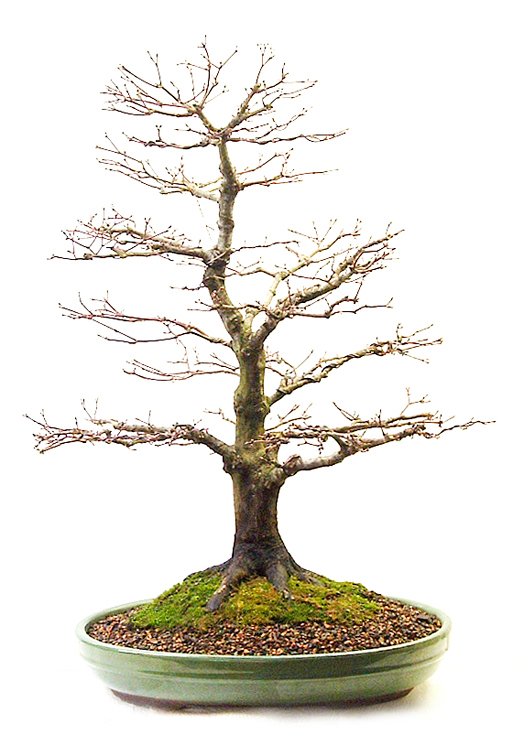 I know some bonsai growers that place their trees on a wheeled cart in their garage or shed and pull it outside on nice days and back inside if the weather dictates. I have carried my trees back and forth many, many times during spring’s changeable weather. On those nice warm days, get out and clean up your display tables and benches. For the next two months or so, we will be busy, busy, busy.